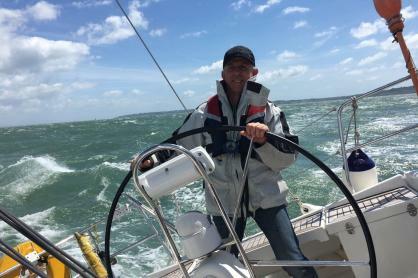 If you are looking for exhilarating and enjoyable yachting in the Solent, UK South Coast, Channel Islands and Northern France – whether private yacht charter or corporate entertainment; whether bareboat yacht charter or skippered yacht hire, Hamble Point Yacht Charters has the perfect yacht for you. We offer an extensive fleet of beautiful, privately owned yachts for bareboat charter, skippered charter and corporate sailing days and events. Each boat is superbly equipped, maintained and presented. We are located at Hamble Point Marina, the most convenient marina on the edge of Solent in the heart of the UK’s sailing mecca near Southampton in the South of England. And all of this is delivered with a friendly, personal service. Our large and varied fleet of sailing and motor yachts is available for bareboat charter and skippered charter within the Solent, along the South Coast and across the Channel (a handful of yachts are only available with skipper). As our yachts are privately owned, they are not company branded and do not look or feel like charter yachts. If you lack confidence or crew, or want to enjoy a relaxed sailing trip without the pressure of skippering, you can arrange for a skipper to join you for all or some of your charter. Please note, for your own safety, prior sailing experience is a pre-requisite for bareboat charter. We are experienced providers of hospitality events on the water in the Southampton area for all budgets, and can organise corporate sailing events, company sailing days and team-building activities ranging from a Solent day sail with lunch in Cowes to elaborate regatta race days and cross-channel multi-yacht events. Hamble Point Yacht Charters is the UK’s leading independent charter fleet operator, based at Hamble Point Marina near Southampton, moments from the centre of Solent Sailing on the UK’s South Coast. If you are not yet one of our regular customers, come and see for yourself.